I sorely miss news from You. If I remember right, you promised to write every other day. But you have not. I do not think I have received more than two letters from you and one from Gittan. Stig has been kind and sent me two. If you don’t have much to write, then write a short letter. It’s the greeting and the knowledge that all is well, which calms me down. Not many days pass until you notice a bit of discouragement in Ivar's letters home to his wife Gull (born Hasselrot) in Örebro. The city of Merzig in the Saarland is far from Sweden, in the borderlands between Germany and France. Ivar af Sillén is, in his role as company commander in the Saar Battalion, also second in command for the Swedish troupe of 261 men, who were going to keep order in the Saarland and monitor the referendum there on January 13, 1935. The Saarland was governed by the League of Nations (LN) since the Treaty of Versailles in 1919, and the referendum was to decide if the Saarland should be granted to Germany or France, or if the status quo should be kept, i.e. to continue to be governed by the LN. The lack of experience of similar foreign missions seemed to have affected both the officers and the men, leading to lesser power games and irritation among the officers. In a letter, dated 25-12-1934, he describes the last drink on Christmas Eve in the improvised messroom. We concluded the evening with a quiet whiskey in a rather stifling atmosphere. The Chief is no ray of sunshine, silent and serious. Intendant Callmer is an effusive gentleman, whom I’ve already been obliged to put in his place. That man doesn’t amuse me much. He does not comprehend his place and position. This is between us, since it is no good if word gets out that we do not get along down here. I long very much for news from You. Missed them very much yesterday. I wonder how you are. The Staff Office is pervaded with a sombre mood. Before the group had been firmly established, Ivar’s letters give the impression that he and his colleagues are careful not to show weakness, which may affect the dynamics of the group. The insecurities within the officer group settled after a couple of weeks, and they seemed to find their roles. Ivar’s homesickness was strong during the whole period, but to discuss this with his officer colleagues was not in question. 11/1 It is strange not to know how long you must stay here. I believe I van sense a general longing for home. Mine is probably the strongest still. But you will have to experience a lot of things, which are not very amusing. The lack of opportunities to ventilate one’s feeling is reflected in Ivar’s letters, that often concerns the difficulties in handle the ennui, getting along with the colleagues, the influenza ravaging the troupe, in addition to the awful weather where the sun only being visible three times in the first month. The letters from home are one of the few causes for rejoicing. 3/1Spend a couple of lines on me often. When I read your letters, it is the only time of the day when I feel joy. 7/1 We have had sleet today, clinging here, there, and everywhere on the body. A cold epidemic, influenza, have affected nearly every one of us, almost. 24/1 The weather down here is very trying. This constant fog and humidity puts tremendous pressure on body and soul. [...]By the look of things, the Italians will leave first. They have difficulties tolerating the climate. Several deaths within contingent number 3. When the referendum finally has been carried out, a sense of relief spreads among the officers. The assessment of the Swedes’ contribution was good, and since the feared disturbances after the referendum failed to appear, they could focus on establishing connections with the command from other nations and provide entertainment for the men. 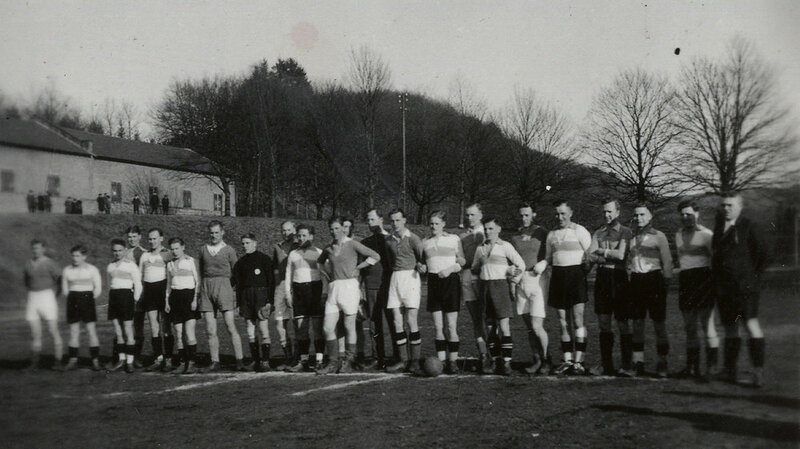 Ivar arranged football matches against local teams, and other company commanders let their men find entertainment in the city of Saarbrücken. 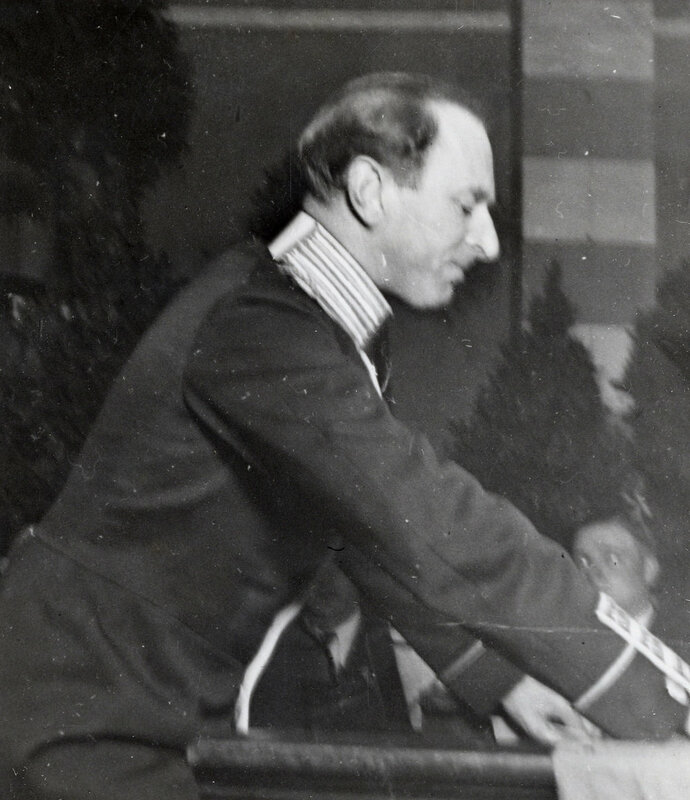 Ivar, who had a gift for languages, took on a big responsibility for the representation and communication between the Swedish and other foreign troops, consisting of British, Italian and Dutch troops. On February 2, the Swedish contingent arranged a charity evening with more than 200 guests from the other troops, as well as local Saar politicians. February 1. Soon I will make an effort to knock off a speech in German for the charity event tomorrow. I am not amused by this, as you might understand. Nordenswan always stays away, when it comes to public appearances. I have yet to hear him say 5 words in German. He is very eccentric. He is not one of those with inferiority complex. You might understand that one is fairly tired of them all. At the party, Ivar gets a message that his wife's grandmother has passed away. He answers her the next day where he gives his condolences and tries to describe what the grandmother meant to him. His difficulties to give consolation through a letter is obvious, and he writes that he still doesn’t know when the Battalion may return home. The only thing he knows is the rumours circulating . Though, on the 7th of February the information comes. We cannot believe that we may depart soon. The time down here seems like a year. A couple of days later they get a definitive decision that they are to travel home on February 18 and are expected to arrive in Stockholm February 20, on the night train. Ivar's longing for civilian clothes is apparent and he asks his wife to bring a hefty wardrobe. Ivar's last letter is dated 16-02-1935. What happened after their return is thus unclear, but the relief in finally leaving the Saar is not to be mistaken. Ivar’s thoughts on the weather, sicknesses, the lack of letters and news from the family, the difficulties in handling problems at home, and the lack of information regarding when the mission is over aren't his alone. Those troubles are also present in the participants of what is usually called the first peace keeping mission, the one in Schleswig-Holstein, 1849-1850. It might have been Ivar’s grandfathers father, who wrote to his mother from the borderlands between Denmark and Germany, that cold and soggy winter, which was putting a strain on the Swedish-Norwegian peace-keeping troops. We don’t know if Ivar af Sillén's forefather participated in the mission in Schleswig-Holstein, but lieutenant Otto Ringheim at the Northern Scanian Infantry Regiment did. He had an intense correspondence with his wife Margrethe, his Aunt, and his Mother during the entire period of the mission. Below is one of his letters to his mother transcribed. It is dated December 16, 1849, in which he misses his family very much when Christmas is at hand. The similarities with the letters from Ivar af Sillén are striking. Three generations and 85 years separate them. The mission and their feelings unite them. As I presume these few lines will arrive before Christmas, I may as well wish my dear mother cheer and happiness within the little domestic world, where I would like to enjoy the joy and peace of home. I am really saddened by having to be so far away, and not in any way being able to dispatch the nice Christmas gifts I otherwise would have had in good order for everyone back home. Here, we have decided to be together and arrange a little Christmas gift lottery, very modest, to whittle the long evening away. That Christmas here will be especially unbearable is expected, since we, due to the Germans' unwillingness, do not have a single house to spend time together in. My hosts, who belong to the most energetic party, I haven’t visited for a long while, and I probably will not go there until the new year, since their politics twaddle is quite unbearable. I worry many a day for Margreths health. She wrote to me not long ago that she hadn’t visited a ball due to being sickly. And as she mentions it, I know that maybe it was no trifling?Though it looks like I will not be able to see my beloved Margrethe until spring, and the General, who recently was here and announced this to the soldiers, who wanted to know when they would be allowed to march home to their fine matrons in Skåne. Now they say anew that the armistice will be prolonged. In that case I will return to Lügumkloster for a month, and that will be a nice march in the deep [???]! Mother shall be so kind and tell the little boys that here are a lot of nice toys for a rare price, exemplary soldiers from all kinds of regiments in Europe, and I have well pondered how to send them home as Christmas gifts, though it is impossible. But I will not forget to bring them in Spring. The unpleasant weather, alternating between rain and cold weather, have caused a lot of sickness among the soldiers. By the grace of God I have been rather healthy, especially since I began to use the comfortable woollen socks that Mother got for me at the departure, since the linen socks I brought were too thin. I presume that all the relatives will stay with mother some time during the holiday, then be so kind as to give little Fredrik’s sister the Christmas gift on hand. To the sweet little singer, I cannot find anything to be sent in a letter. At the present I have no time to write Carl and Ferdinand. I do not know if Ferdinand is at home. When mother dear writes them, do not forget to send my regards! Now it has been so long since I had news from Margrete. God give you all health, a good life and a joyful Christmas. P.S. To all the relatives, many regards from T.S.